JNN 23 April 2014 Cairo : Egypt’s election commission said on Sunday that only two presidential hopefuls, one of them the powerful former military chief who nine months ago ousted the country’s first democratically elected leader, have submitted their documents to run in next month’s election, AP reported. With only two people — former army chief Abdel-Fattah el-Sissi and leftist politician Hamdeen Sabahi — vying for the country’s top post, the race is certain to be dramatically different than Egypt’s 2012 presidential election, when 13 candidates of all political stripes competed in a heated campaign. On Saturday, Sabahi formally submitted the required documents to the electoral commission after he managed to gather 31,555 signatures from Egyptian citizens endorsing his candidacy. 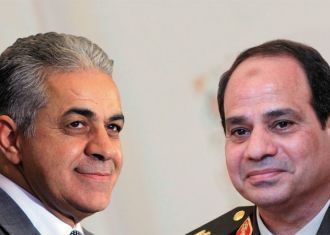 Sabahi finished third in the 2012 presidential election, which was won by ousted President Mohamed Morsi of the Muslim Brotherhood party. Sisi, who led the military deposal of Morsi in July 2013, is widely expected to win the presidential vote scheduled to be held on May 26-27. Egypt’s ex-army chief submitted his documents on April 12 after gathering 188,930 signatures of support, well above the required 25,000, the election commission said. Political parties and figures in Egypt have repeatedly called on the country’s army to stay out of politics. The Muslim Brotherhood holds Sisi responsible for masterminding Morsi’s removal. Sisi is also accused of leading a severe crackdown against supporters of Morsi and the Brotherhood movement. Anti-government demonstrators in Egypt have been holding rallies almost on a daily basis since the army toppled Morsi, calling for the former president’s reinstatement. Egypt’s military-backed government has launched a bloody crackdown on Morsi’s supporters and arrested thousands of Muslim Brotherhood members, including the party’s senior leaders. Human rights groups say as many as 1,400 people have been killed in the political violence that erupted following Morsi’s ouster. This entry was posted in AFRICA, Middle East and tagged 2012 presidential election, Egypt, election commission, Mohamed Morsi. Bookmark the permalink.